One of the great things about being a quilter is our quilting community. 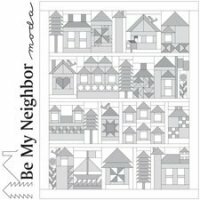 To honor that sense of community we are offering Be My Neighbor, a series of 16 free downloadable house patterns by MODA. Each week, from now until Dec. 19, a new "blueprint" will be available on our website. Download each blueprint while you can-they will only be posted for 2 weeks! Be the first to bring in a completed Neighborhood quilt and win a prize from Quilt Patch! Click here to download the first block Block 1. Welcome to the MODA-'hood! Won't you be our neighbor? Please join us for our next Saturday Night Sew on Sept. 17, 3:30-8:30. Everyone is welcome! If you're new to the area it's a great way to meet nice people. Just give us a call to reserve your seat (704-821-7554). There is a $2 fee and we order out for dinner. Hope to see you there! Go to quiltpatchfabrics.com/classes.htm for details. Have fun with this traditional quilt pattern! Use the classic three color scheme or go scrappy; use traditional fabrics or wild ones; make a holiday version or one to match your decor. Got the itch to learn how to quilt? This is the class for you! Think of this table runner as a small quilt; everything you learn here you can apply to any size quilt you'd like to make! A deceptively simple Layer Cake or Jelly Roll friendly quilt. Don't keep those memories folded up in a drawer-turn them into a quilt to cherish. Learn the basics of how to make a t-shirt quilt and make your own one-of-a-kind memory quilt! Tired of all those beautiful quilt tops laying around? It's time to learn how to machine quilt your own projects! We'll cover straight lines, stencils and free motion quilting techniques. Stretch your skills with this jelly roll friendly quilt, using 90 degree triangles. Make one wreath, add borders and it's a lovely seasonal wall hanging for Fall, Christmas, Easter, 4th of July-the possibilities are unlimited! Pajama Party Quilt Retreat NEW DATES! Our retreat class is Scrap Crazy using templates with your choice of pattern. Retreat supplies are 15% off at Quilt Patch-reserve your now!